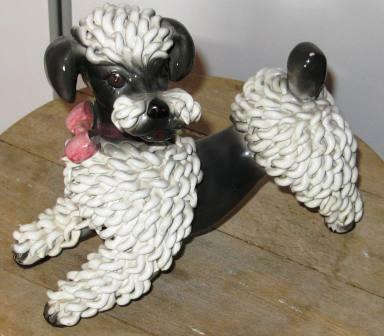 Anything to get away from this terrible cold weather and all the jobs I am supposed to be doing.... a nice distracting post about my spaghetti poodle (and cat) collection. I know I have mentioned these before, but here they are again. Made in Italy in the 1950's, they are surprisingly hard to come by - I think they were manufactured for the tourist trade, are roughly made, and break easily. I got my first one from Snoopers' Paradise in the North Laine, in Brighton around 2005. We used to love that place when we first went to Brighton, but when we have revisited recently, it is but a shadow of its former self - full of tat. I can't now remember which poodle was the first, or what appealed to me about it, but next time when we went back, they had another, and the grumpy bloke on the till, surprisingly, produced a third one from out the back. That was it. I now have 40. Very few come from shops or antique fairs - one enormous (26 inch high) floral one with a detachable hat ashtray from Malvern, one from Rye, and two from the scabby junk yard in Courthouse Street in Hastings. That is surprising, considering the vast acreage of junk and antiques we have picked through over the years. I don't really know why I like them. Often their thickly applied spaghetti curls are broken, or chipped. Some have repaired breaks. They are hand painted, so each has a different facial expression - usually degrees of cheerful gormlessness, and their spaghetti whiskers bristle with hopeful doggy enthusiasm. I like the long-necked seated ones best - they are so classically 1950s, but they also come sitting, standing, begging, in a 'play-bow', holding baskets of flowers and pulling little posy vase carts. 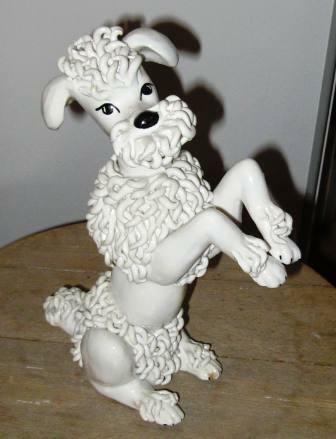 Our friend Alan from Birmingham, who attends even more antique fairs than us, also looks out for poodles for me, and he found my first spaghetti cat - even rarer than poodles. 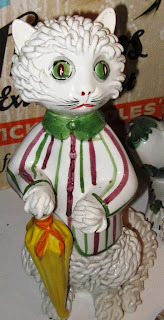 The cats were clearly made by the same people - the style of spaghetti is the same, they have the same black ink writing on the bases, and they have the same collars, but their face are very bizarre, with huge, heavily made-up eyes and bouffant curls they look more like effeminate nineteenth century dandies than cats. 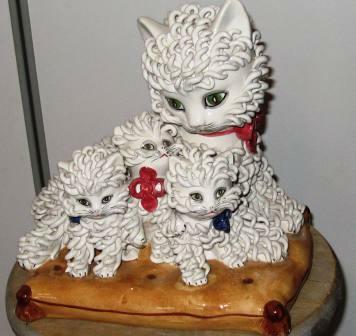 This horrendously kitsch cat family came from the Rye Auction Rooms - only cost me £40.00. You see sets like it on Ebay (in America) and they are hundreds of dollars. Anyway, here is one of my latest acquisitions. 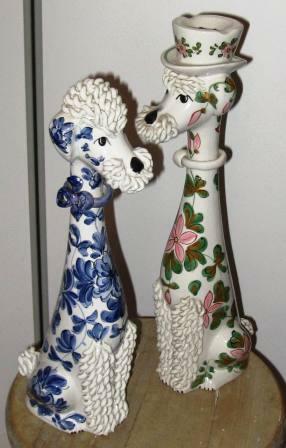 This is actually a different sort of poodle - heavier, with different style floral painting, and a very different face. If possible, he looks even more gormless than the normal ones. Not surprisingly, I have never met anyone else who collects these things! I would also like to know more about them - where in Italy they come from, who manufactured them, but searching on the internet gets me nowhere. I collect the spaghetti cats too! I'm curious to see what ones you have in your collection. Hello!!! 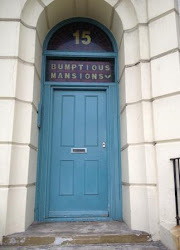 I I'm delighted to have stumbled upon your blog! I'm a huge collector of the Italian spaghetti figurines. I have really been looking for someone who also collects and would like to chat about them. I was hoping to at some point form a group of collectors on Facebook. I really hope that you are up for chatting and maybe sharing some pictures are collections! Was so excited I replied in a new comment - see the blog again! I think we must connect somehow to exchange photos of our collections, I collect the cats! Hello - thanks for that! My collection has grown somewhat since I wrote the blog post! I am on Facebook as Stephanie Gaunt and I also have a Pinterest board. A FB group would be fun! 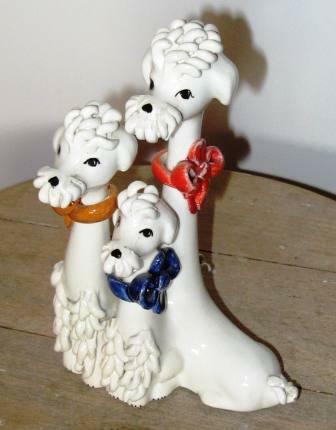 I have been collecting dogs for years. Have about 2500 of them now. 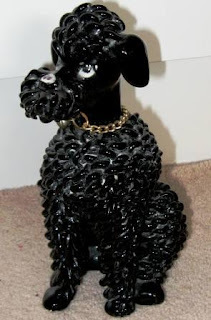 My poodles and my Scottie dogs are my favorites. I keep most of my poodles in my bedroom. Above the window, on the dresser, on the headboard, everywhere. LOL My house is a dogs house now. I would love a FB group. That would be fun for sure. 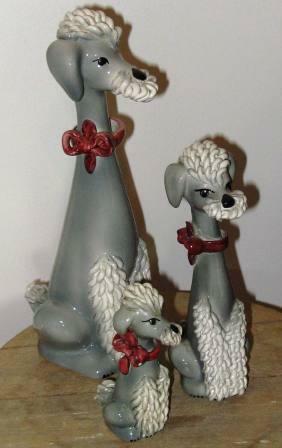 Hi Suzanne - glad to hear you are into poodles.... I think it might be a small FB group though - and it would only be for spaghetti poodles... and cats! I have a very large collection of the cats, it stemmed from my dad inheriting my grandmother's collection of the dogs! I have searched far and wide on the internet to find as many of them as possible- most people don't even know what they are. As many as I have stumbled across on eBay over the span of 2 years and there are still some that I've seen photos of that I have never seen for sale. However, I have one that I believe to be one-of-a-kind, and ironically enough my first one that my parents found at an antique store in Ohio- it's a ring of 9 kittens measuring about 14 inches across. Would love to see pictures of your cats and likewise I will show you mine- maybe via Facebook? see below- lovely to hear from you! If you click on the link to the Hastings Battleaxe blog at the top of the post, you will find a link to my Stephanie Gaunt Facebook page. Send me a friend request and I will add you to the new Spaghetti poodles and cats group when I create it! Hello - lovely to hear from another collector. I am planning to set up a FB group called 'Spaghetti poodles and cats' It will be a very niche group because there don't seem to be many of us! The Hastings-Bexhill Link Road - Route to regeneration, or road to the white elephants’ graveyard? The Church of England should be disestablished - now.